There has been a lot of hoopla over the Xbox One announcement. I think even governments are starting to get jealous of its monitoring capabilities and leering privacy concerns. I have been struggling with the recent announcement myself and figured I would rant about it a little. I am sure you won't mind. The thing that disturbs me most is that I am not the target audience for the Xbox One even through I have stood in line for every version at launch and was a day one member of the service. When Microsoft announced the Xbox I knew they would be a force in the gaming industry, and supported the platform heavily. I am an older gamer with a family of gamers, and in turn have 3 consoles and 4 roaming profiles under my roof. I will admit this may not be a typical scenario, but I wager it is not rare and will become more common in future generations. There are a lot things about the Xbox One that lead to major problems in my ability to use the device. First of which is I do not game on a large TV: whether PC or Console Gaming I play on my desktop monitor. Not to say it is a small screen, but there is competition on the many screens in my house whether someone else wants to watch TV, use a computer or play a console. Although we are in the same room, only in a small number of circumstances are anyone doing the same thing at the same time: sometimes we maybe even more than one. This leads to use all being very close to our screens which is not what the Xbox One is designed for. All privacy issues aside mandatory Kinect is a killer in this situation. I own a Kinect and dig motion controls and other features, but it requires a certain environment. 99% of my game time is spent wearing headphone in a loud environment playing on a desk through a computer monitor. The only place I could put the Kinect would have it staring at my check and would block the bottom portion of my screen. The new Kinect would have to be a lot better than the current one to work like this: assuming I was willing to obstruct my view and wanted it monitoring me and the room I sit in. Although the features might be nice in the right environment making it mandatory just means I am excluded from using it. 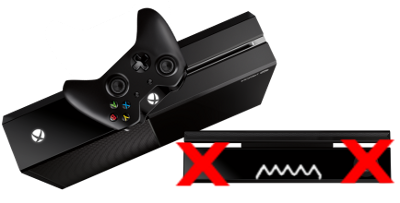 The DRM issues with the Xbox One is another hurdle that I would need to overcome. Currently it sounds like games will be linked to your Xbox Live account which will be verified via Kinect. Hopefully there will be a "family" option because I cannot afford to buy 4 copies of a game so 4 different Xbox Live accounts in my house can play it. I will simply move gaming to another format that is more sharing friendly. If I did stay with Microsoft under these conditions I would definitely be buying less different games since I would have to buy multiples of the same games. Then you have the internet phone home system where the Xbox will need to connection every 24 hours or so to make sure you still own your game. I already have issues trying to make content available to my family without having to purchase the same thing over and over. If someone buys an Xbox Live game or has a download code, then it will only work, for anyone but the purchaser, on 1 of the 3 Xboxes in the household. If the purchaser account is playing on any of the 2 Xboxes and the internet goes out for even a short time, the games boots them out usually without saving. Even full games will freak out if you have downloadable content. Because of this I rarely use download codes even if provided for free. Xbox One takes this up a notch and makes things far to difficult. I think DRM is the coming death march for consoles. When PCs were expensive and hard to setup, Consoles were less expensive alternatives and approachable. Now tablets and phones fill this space which can sometime be free or very inexpensive, and most games on them are far cheaper. This is the first time a console generation has faced this situation, and even this generation has been facing dropping adoption. Making games harder to share and taking cheap used game out of the market will certainly chill sales and product innovation. No DRM has kept a pirate from his booty. The Xbox One and PS4 rounds of DRM will be squarely focused on the used game market. Publishers see used games are theft since you never owned the game anyway; you only license it. Cheap games lead to people owning more games which has directly helped the growth of the current console market. Stopping used sales and crippling sharing will only reduce exposure to games and shrink the market. Get ready for having "both kinds" of games: Halo and Call of Duty. Ready for the smallest yet most annoying thorn in my side? Front, Slot loading Blu-Ray drive. Now with all the DRM and connective "features" there is no reason to really have discs at all, but a slot loaded player? Really? Even slot loader I have had ate discs for breakfast and I would only ever put copies of discs in them. Not to mention slot loaders cannot sit on their side, and if you remember I play at my desk. Even if you wipe everything complaint I have I am still locked out because I would have no place on my desk to put it without buying new desk. For me this is all depressing. I put a lot of time and money into the Xbox platform. I have a gamerscore I am proud and a decent Xbox Live Arcade library (which by the way will be useless on the Xbox One). Everything about the new Xbox's design clashes which how I enjoy to game with very little benefit. I hope Microsoft plans on releasing some good information to counter my concerns, but it seems more likely this will be the first Xbox launch I will not be standing in line. Microsoft will loose an entire family of Xbox junkies if these issues are not addressed or the design modified before launch. Lucky for us there are plenty of alternatives, so not sure what Microsoft gains from this. GOG and Steam are very competitive on price and quality of games without many of these problems which don't mesh with my environment; however, I would much prefer to stay with Xbox if Microsoft decides to focus more on gaming and less on the living room.